Despite the approval of a new communications law in 2014, historic media concentration in the hands of a few economic groups persists in Uruguay, according to a recent investigation. A pending Jan. 1, 2019 deadline means these media companies have just over a year to adapt to the legislation. 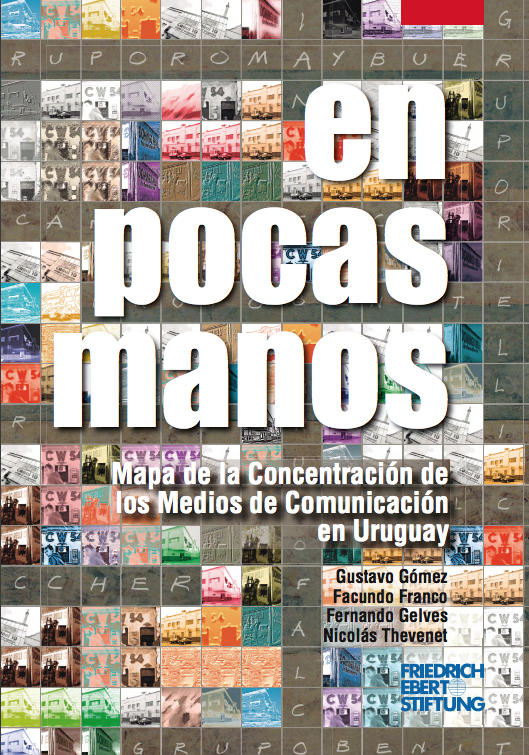 The book “En pocas manos: Mapa de la concentración de los medios de comunicación en Uruguay” (In few hands: Map of media concentration in Uruguay), published in early December, warns of the continued existence of numerous cases of concentration of ownership and uses of media licenses, both in the Uruguayan capital of Montevideo and in other cities in the country. "The investigation prioritized the current situation of ownership and control of the media in Uruguay, to determine if Uruguay is complying with international standards on freedom of expression and if there were situations of undue concentration that should be adapted to the current legislation," Gustavo Gómez, one of the authors of the book and executive director of the Latin American Observatory of Regulation, Media and Convergence (Observacom), told the Knight Center. 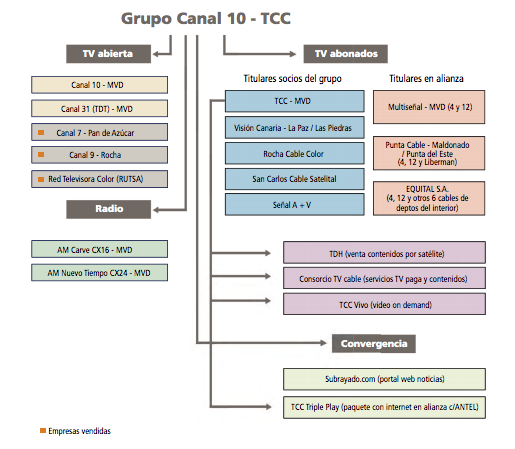 The analysis confirms the existence of a "media oligopoly formed by three large economic groups that, among other media, control commercial TV channels of Montevideo (open and paid TV): the Villar/De Feo group, of Channel 10; the Romay group, historically associated with Channel 4; and the Cardoso/Scheck group, from Channel 12," Gómez said. According to the research, these three major groups represent the most emblematic cases of media concentration in Uruguay. The investigation not only analyzed the media concentration of the large media groups, but also that of smaller economic groups that exert great influence on the local information agenda in their cities. In this sense, the analysis included media concentration by economic groups in the departments of Durazno, Lavalleja and Rocha. Article 53 of the communications law establishes that in Uruguay, no person or economic group can have more than three media outlets and no more than two media on the same frequency. The same law defines the timetable for adapting to the new media concentration limits, Gómez said. "Non-compliance would be very serious and there could be important sanctions, which could lead to the revocation of concessions for the violation of the freedom of expression and Uruguayan population’s right to information," he emphasized. Gómez explained that the Declaration of Principles of Freedom of Expression of the Inter-American Commission on Human Rights (IACHR) says that monopolies and oligopolies "conspire against democracy," and that the same text is included in Uruguayan law. For example, the investigation indicates that the Romay group has eleven radio stations to date, and four television companies for subscribers. In addition to Channel 10 and cable channel TCC, the Fontaina-De Feo group has two radio stations. The Cardoso-Scheck group has radio and television stations, and also two print media outlets, El País and Búsqueda. In addition to Gómez, Uruguayan journalists and investigators Facundo Franco, Fernando Gelves and Nicolás Thevenet also worked on the book. The research also involved teachers and students from the Faculty of Information and Communication (FIC) of the University of the Republic, of Uruguay. The investigation was originally published in the form of articles in the Uruguayan weekly Brecha between April and September 2017. Several of the articles in the book refer to the investigation of 2011,”Private commercial television in Uruguay,” whose authors are Gustavo Buquet and Edison Lanza, current Special Rapporteur for Freedom of Expression of the IACHR. "In Uruguay, media ownership that is concentrated in few hands is not a novelty, but the last study (from Buquet and Lanza) is already 6 years old, and we planned to update it," Gómez said. "Therefore, multiple actors, especially from civil society, but also from academia, were satisfied with the book’s publication," he added. Subscribe to our weekly newsletter "Journalism in the Americas"